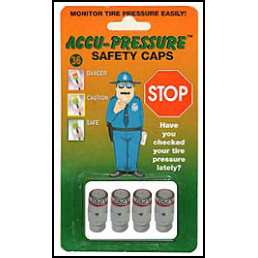 Accu-Pressure Aluminum Hex Safety Caps (SET OF 4), Accu-Pressure Safety Products, Inc.
Get the ACCU-PRESSURE ALUMINUM 2 COLOR HEX CAP for your motorcycle, car, or SUV. This product helps drivers know when their tire pressure is too low and carries a 3 YEAR WARRANTY! Pressure Setting: 28 lb.Pressure Setting: 38 lb.